A boundary dispute is a disagreement over the location of a property line. When you buy real estate or property in the State of Florida, your deed should include an accurate legal description of the property you are purchasing. One type of boundary dispute is encroachment. An encroachment occurs when an individual occupies any portion of land above or below the surface beyond what is described in the deed. It is important to note that the individual who has encroached upon the other person’s land does so without either an easement or agreement to do so, or any written instrument, judgment, or decree giving title to the encroached land. An easement is a legal right given to a person or entity to use property or land belonging to another person or entity for a particular purpose. For example, access to private property given to utilities or a phone company to bury cables, phone lines or run pipes or even neighbors sharing a right-of-way access to a development’s playground. Some easements are created by adverse possession where, over a specified period of time, a person openly, hostilely and continuously uses the land of another person. 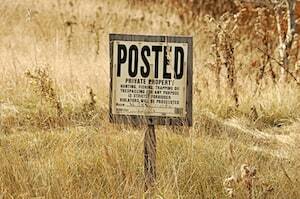 If the trespasser successfully continues open, hostile and continuous possession for the prescribed period, they may hold a prescriptive easement. Mistakes in deeds: Many boundary disputes are caused by an error in the legal description on the deed. If land surveying was completed improperly or if the boundaries were marked improperly, a deed may improperly represent the intended property lines of the original owners. Easements: An easement may be established through a deed, by regular usage of the property, necessity, or by license or permission. Often these descriptions are unclear in a dead or other instrument. Covenants: A covenant in the deed may restrict property to certain uses or require that the property owner take certain actions with regard to the property. Many covenants often arise in subdivisions or neighborhoods. KALIS, KLEIMAN & WOLFE’s attorneys have worked with Miami and Fort Lauderdale real estate developers, builders, businesses and homeowners to facilitate development projects, protect their land, and resolve boundary disputes and easement disputes for more than 20 years. The owner of the encroaching structure has several defenses that a Florida real estate lawyer can raise, including boundary by acquiescence, boundary by agreement, and adverse possession. When you are facing a dispute over a boundary or easement of your property, contact the experienced Real Estate attorneys at KALIS, KLEIMAN & WOLFE, the Davie-based real estate law firm today at (954) 791-0477.